Adjustable gastric banding with either the LAP-BAND® or REALIZE® Band is the third most frequently performed bariatric procedure. It has the lowest rate of complications. In this procedure, an adjustable silicone band is placed around the upper part of the stomach to create a small pouch that can hold only small amounts of food. 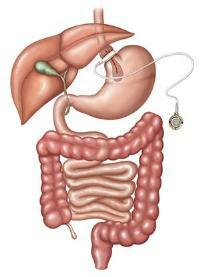 The narrow passage between the pouch and the rest of the stomach slows the passage of food. This helps to limit the amount of food that can be eaten at one time and increases the time it takes for food to be digested. During the procedure, an injection port is attached to the abdominal wall. The port is connected to the band with soft, thin tubing that is hidden inside the abdomen. Your physician can adjust the band by injecting a saline solution through the skin and into the port. Adding saline to the band tightens it and increases the amount of restriction, helping patients feel full sooner and with less food.